How to create a glowing weapon with pre-20th Century technology? In my hypothetical world, a bladesmith is challenged to create a sword with supernatural properties by the King, to prove his ability. The swordsmith wishes to present the King with a sword that glows. My first thought was that he could make a normal, strong sword, and then somehow 'dope' it with radium, or another radioactive element (This is probably an extreme misunderstanding of such a process). However radium was only discovered and isolated in a usable form in 1911, which is outside the time period. Assuming access to pre-20th Century technology and knowledge how does 'the most skilled bladesmith in all the land' accomplish creating such a sword? Are there any examples of such a weapon in history? Simply apply zinc to it. Sphalerite ((Zn, Fe)S) is a mineral that is the chief ore of zinc. Around 95 % of all primary zinc is extracted from sphaleritic ores. Some specimens have a red iridescence within the gray-black crystals; these are called "ruby sphalerite." The pale yellow and red varieties have very little iron and are translucent. The darker, more opaque varieties contain more iron. Some specimens are also fluorescent in ultraviolet light. Zinc sulfide, with addition of few ppm of suitable activator, exhibits strong phosphorescence (described by Nikola Tesla in 1893), and is currently used in many applications, from cathode ray tubes through X-ray screens to glow in the dark products. When silver is used as activator, the resulting color is bright blue, with maximum at 450 nanometers. Using manganese yields an orange-red color at around 590 nanometers. Copper gives long-time glow, and it has the familiar greenish glow-in-the-dark. Copper-doped zinc sulfide ("ZnS plus Cu") is used also in electroluminescent panels. 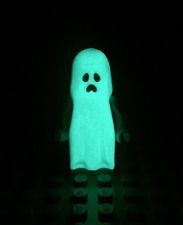 It also exhibits phosphorescence due to impurities on illumination with blue or ultraviolet light. Not so impressive for us, who grew up playing with such toys. But this would sure look like the devil's work to people from two hundred years ago. Phosphorescence: now this is where it's at. The sword will not shine very much under sunlight, but at night it may give off enough light for you to read by it, and will do so for hours. Requires sunlight to charge. Last but not least: a blade made of this material would be unfeasible. You want to carve it on the sword, either as gems, or as engraved patterns. You may use spharelite powder for the latter. I'm afraid this will not be possible. At the most, the blade's fuller can be re-made using sphalerite or other phosphorescent substance. Radioluminescence, even with 20th century technology, would require very powerful radiation levels. Being in the same room with such a blade would be unhealthy enough that the blade would be thought cursed, and the blacksmith promptly burned at the stake (Tritium radiofluorescence is too weak to have the blade "glow" - unless one prepared a hollow crystal blade perhaps; doping the metal with radioactive elements, i.e. leveraging Cherenkov radiation, requires an alpha emitter of very high intensity). There are several slow-burning substances that smell little, and nothing like fire or smoke (some nitrates have a distinctive loo smell). Choose one that is solid and adhesive enough, coat the blade and add colorants (copper to burn green, salt to burn red etc). Hide a spring-mounted flint on the scabbard, so that when the flint is armed, drawing the sword will ignite the blade. The flame can last up to half a minute. Iron and sulfur can be used to make a sort of Roman candle effect. 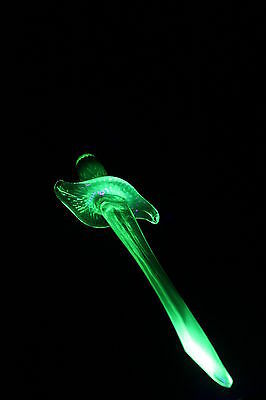 You will make the sword out of uranium glass. Most uranium glass objects are late 19th / early 20th century but the Wikipedia states that uranium glass was also made in the Middle Ages and used by Romans for mosaic tiles. Pre-industrial usage The use of uranium glass dates back to at least 79 AD, the date of a mosaic containing yellow glass with 1% uranium oxide found in a Roman villa on Cape Posillipo in the Bay of Naples, Italy by R. T. Gunther of the University of Oxford in 1912. Starting in the late Middle Ages, pitchblende was extracted from > >the Habsburg silver mines in Joachimsthal, Bohemia (now Jáchymov in the Czech Republic) and was used as a coloring agent in the local glassmaking industry.Martin Klaproth (1743–1817), who discovered uranium, later experimented with the use of the element as a glass colourant. 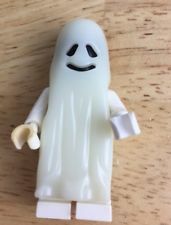 But how to make it glow? I am sure you do not have black light. You need to go out when most ambient sunlight is in the very short wavelengths. Blue hour. The blue hour (from French l'heure bleue)1[a] is a period of twilight in the morning and in the evening, during the civil and nautical twilight phases, when the sun is at a significant depth below the horizon and when the residual, indirect sunlight takes on a predominantly blue shade… This effect is caused by the relative diffusibility of short blue wavelengths of light versus the longer red wavelengths. During the blue "hour" (typically a period about 20 minutes in length), red light passes straight into space, while blue light is scattered in the atmosphere, so reaches Earth's surface. What is true for blue should be even more true for ultraviolet. I feel like I have seen things glow somewhat at dusk but I struggled to find an image on google to demonstrate the effect. Your king will not be doing battle with this sword. It is a sword for cool walks at dusk. But it will be a sword, and under the right circumstances it will glow. Probably not the answer you are looking for, but if there is no requirement that the sword be made of metal, then, make it out of wood, remove the fuller and fill it with ... mushrooms. This sword emits light all the time, but it is only visible in darkness. It could probably be produced by the ancient Greeks. An even bolder solution for non-iron swords, would be to make it out of glass, empty glass to be precise, and fill it with a complete microsystem, inclusive of phytoplankton and these bioluminescent creatures. The phytoplankton will produce the oxygen and the food for the light-emitting sea-sparkles. The dead sea-sparkles produce the food for the phytoplankton. It requires a bit of trial and error, but eventually the right combination can be found (link for the skeptics). This sword emits light every time one shakes it, best viewed at night. This could be produced with XIX century technology, as long as it is not a very long sword. Finally, for the iron sword, we could resort to embedding a Van de Graaf generator in the design. The electrostatic discharge along the blade may create a visible glow due to corona discharge (try it at home, it is quite cool). The embedding of the Van de Graaf requires watch-making skills. There will be two such machines, on in the handle based on a spring-loaded mechanism, which needs regular winding, and one in a charging station hidden in the ceremonial sword-holder, i.e. a big vase vase connected to a flywheel running a larger Van de Graaf machine. Take the finest sword in the land, make the pommel hollow. Inlay a platinum (scientifically described in 1752) filament into the sword. The filament will have to be insulated where it contacts the reasonably conductive steel, but there are a variety of ways to do that. Discharge the capacitor, the sword briefly glows like a lightbulb (demonstrated in 1802). Because it is a lightbulb. I'm going out on a limb here, but just give me a shot. I know I know, you specifically requested something other than this because of the discovery date, but for the sake of argument let's explore it a little more. Other answers have provided a lot of creative and neat alternatives, however none of them would make a practical sword. The radium solution would let you have an actual, usable sword, that would glow very nicely, even in a range of colors. Your main problem with it just seems to be that it was, in our history, discovered a hair past the deadline. That is really the only weak link in the solution, but you could easily work around that without requiring suspension of disbelief. Not all of ancient history is well-documented. There's plenty we don't know about our own history, even during the time of written records. For crying out loud, we're still (somewhat) arguing over how the Egyptians moved some rocks around. It's really not out of the realm of possibility that radium was, even by accident, isolated much earlier than 1911, and the details of how and where were simply lost. Virtually every major religious text mention someone at some point wielding a flaming sword, or similar fantastical implement. We often dismiss those as just stories, but a lot of what appears magical in the past was likely inspired by actual events that were simply misunderstood. You're going for effect, right? If someone crafted a glowing sword after 1911, there would be zero mystery and therefore nobody would pay attention beyond going "Oh that's neat." If you want a powerful king to have a fantastic weapon, it's actually necessary that the methods of its creation be unknown to the public. Maybe the king himself doesn't even know the secret, it was just gifted to him by a legendary swordsmith or alchemist who may or may not fully understand how they made it. Okay so now the bad news. Radium, of course, is radioactive and hazardous. It also can't be applied in a permanent fashion, but luckily the phosphorescent coating that is the actual glowing part can be re-applied as needed. The hazards of the radiation aren't trivial, but they also aren't totally detrimental. If your king is only carrying the sword into battle or for ceremonial purposes, and it is safely stored otherwise, he could say relatively safe from it. Also your swordsmith would be at risk, but if he learned from a predecessor or even from experience, he would probably know that something about the magical material was unsafe, and could limit his own exposure so that it doesn't hurt him too badly. Not the answer you're looking for? Browse other questions tagged science-based weapons or ask your own question. What population would a 60km radius island sustain with early XXI century technology? Why would you create a sonic weapon? How to create a seawall with medieval technology? How to make glowing rain/mist? How much force would this weapon apply? With 12th-15th century technology, is a “vending machine” possible?